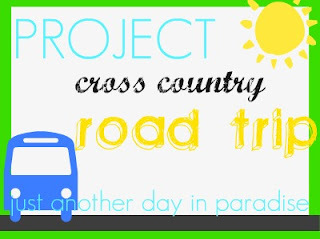 I decided to morph Recipe Thursdays with Project: Road Trip this week. Since food/snacks/treats/bribes are so important in maintaining peace in the vehicle, I wanted to prepare a couple of fun snacks. I am sharing this recipe for Homemade Cheez-Its. Making homemade crackers is kind of a cool thing to do. I felt all accomplished. The Little Men loved the idea of homemade crackers too. Combine cheese, butter, shortening, and salt in the bowl of your mixer with the paddle attachment. Mixture will be crumbly. Slowly add the flour, then add the ice water. Pat the dough into 2 disks and wrap in plastic wrap. Refrigerate for at least 30 minutes. When the dough has been refrigerated long enough, preheat oven to 375 degrees. Roll each disc to 1/8". Then cut using a pizza roller. Cut them in columns and rows, making tons of small squares. In the middle of each square, poke a hole using a toothpick. Transfer onto a cookie sheet. Repeat with other disc of dough. Bake for 12-15 minutes or until puffed and browning around the edges. Once cool, pack in an air tight container until ready to serve. I wonder how long it will take my boys to inhale these??? I am so impressed.. your own Cheez-Its. Awesome! What a great idea! Not only a handy road trip (or anytime) snack, but healthier than store-bought, too! Your posts are so fun, and HOMEMADE Cheez-its, I love it!!! I can't wait for a vacay to make these fun projects. Thanks for all the great ideas!!! OH MY GOODNESS!!!! I just pulled a batch of these out of the oven and let me tell you.....they taste better than the boxed ones! I used 3/4 cup AP flour and 1/4 cup whole wheat flour, but that was the only alteration I made. The whole family LOVES them. Our Road trip will be filled with yumminess thanks to this recipe!!! So happy you and your family liked it.Yay! Have a fun trip.